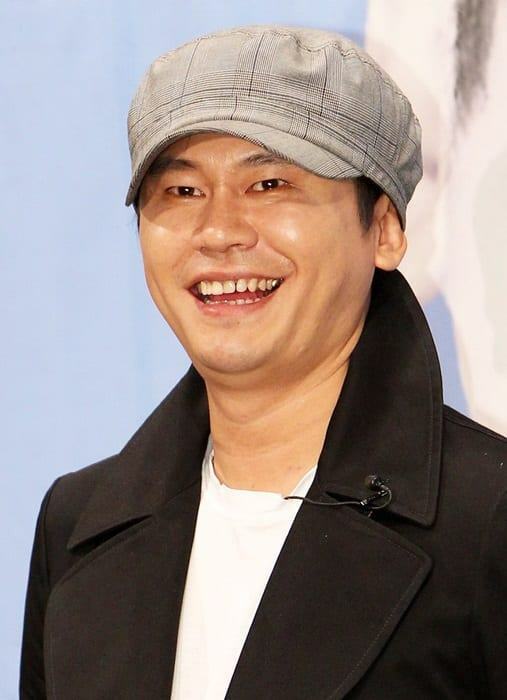 Big Bang’s fans are taking joint action against YG Entertainment. At 10 p.m. on the 16th, fans reportedly carried out a general project on SNS such as Twitter and Instagram. 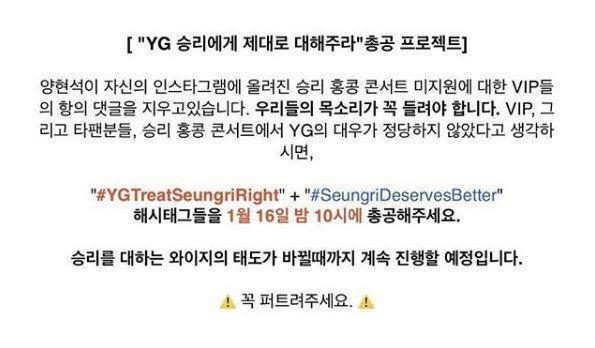 “Yang Hyun-suk is erasing comments of complaints from Big Bang’s fan club (VIPs) about the lack of support for Seungri’s Hong Kong concert posted on his Instagram,” said the fans in an announcement for the project, “If you think YG’s treatment was unjust, please post the hashtags at 10 p.m. on the 16th.” “We will continue until YG changes its attitude toward Seungri,” they added. 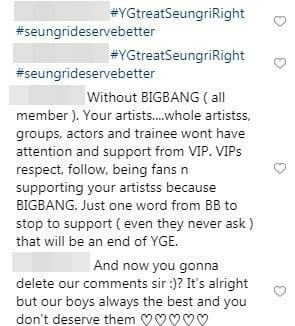 As of the 17th, in Korea, more than 6,800 postings were posted on Instagram with the tags #SeungriDeservesBetter and #YGTreatSeungriRight. More than 100,000 tweets were posted on Twitter. In other countries, it was ranked No. 1 in real-time trends. Controversy over YG not supporting Seungri’s concert erupted right after his solo concert in Hong Kong on the 12th. During the concert, Seungri said since YG’s president Yang Hyun-suk knew about it being held in Hongkong late, he couldn’t send back-up dancers to support him. He actually performed the concert with only two dancers. 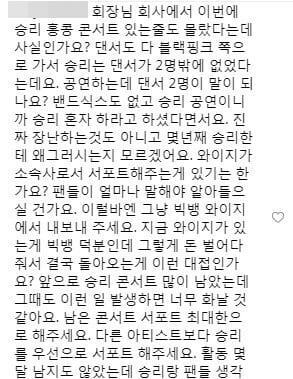 Fans are constantly posting comments on Yang’s SNS, saying, “His agency didn’t support not only dancers but also bands.” YG has yet to make an official announcement on the controversy over the concert.